WASHINGTON, D.C. -- The enduring unpopularity of Congress appears to have seeped into the nation's 435 congressional districts, as a record-low percentage of registered voters, 46%, now say the U.S. representative in their own congressional district deserves re-election. 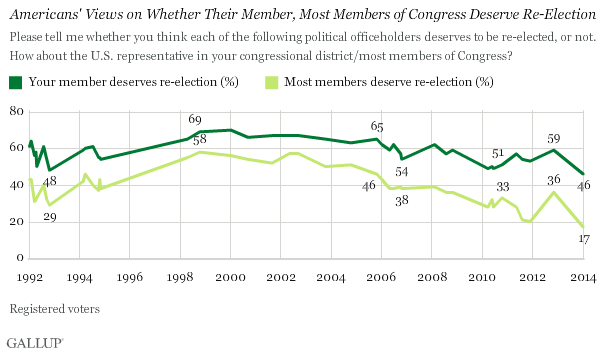 Equally historic, the share of voters saying most members of Congress deserve re-election has fallen to 17%, a new nadir. These findings are from Gallup's annual Mood of the Nation poll, conducted Jan. 5-8, 2014. The percentage of voters saying most members of Congress deserve re-election has been below its historical average of 39% since early 2008. The figure has plummeted since mid-2011, with a brief improvement -- to 36% -- in November 2012, attributable to a surge in Democratic support at the time of the national election. The legendary Speaker of the House Tip O'Neill famously coined the phrase "all politics is local," a dictum that guided his Democratic majorities against Republican electoral waves in the 1980s. More generally, the saying describes the local versus national phenomenon that also occurs when the public is asked about such things as healthcare, education, and crime. 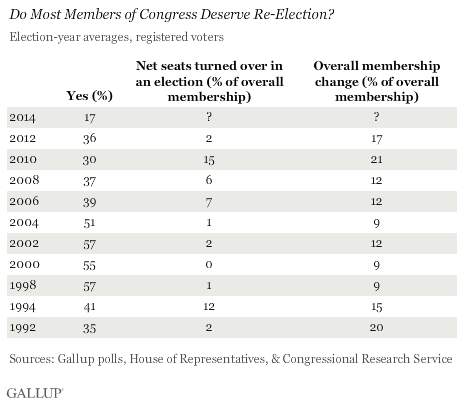 But now that adage rings less true as voters see their own U.S. representative in the same way that they see most other members of Congress -- as not deserving re-election. Can 2014 Be a "Wave" Election? The 17% of voters who now say most of Congress deserves re-election is well below the roughly 40% threshold that has historically been associated with major electoral turnover. With this in mind, Congress could be in for a major shake-up. Judging by net seats lost in an election as a percentage of the overall number of seats, 2010, 1994, and 2006 register as the top three recent elections. All of these years had election-year averages of 41% or fewer voters saying most of Congress deserved re-election, with the Republican-wave election of 2010 registering the lowest, 30% -- still 13 percentage points higher than the current reading. The political direction of any potential electoral wave is difficult to determine, however, as self-identified registered voters of both parties largely agree that most members of Congress do not deserve re-election. Eighteen percent of Republicans, the majority party in the House, say most members deserve re-election, identical to the percentage of Democrats saying so. Thus, voters' wrath appears not to be directed toward one party in particular, as much as toward any incumbent member of Congress.